According to Criteo's travel flash report, during the first six months of 2014, a staggering 40% of American travelers booked their reservations on mobile devices, which was a 20% increase over the previous year's numbers. Due to the instant and convenient nature of mobile devices, travelers prefer this method for making reservations, instead of having to call a hotel for reservations. On the other hand, if you haven't optimized your booking engine for mobile devices, a jaw-dropping 30% of consumers will move on to the competition, while 76% of consumers will not even bother with your booking engine. Simply put, having your booking engine optimized for mobile is a make or break situation. According to a study conducted by Hotels.com, 50% of travelers choose to book their next-day stays or last-minute excursions on their mobile device. It comes as no surprise that independent hotels with mobile optimized booking engines and mobile capabilities are experiencing double and triple increases in revenue generated by mobile devices. If your booking engine is not optimized for mobile devices, you may suffer from a "leaky bucket" effect. This phenomenon explains the ability to attract visitors, but failure to convert those visitors into sales. Check out a few of essential elements of a great mobile optimized website. Simply put, a responsive design is the best solution for mobile booking engines. Booking engines with a responsive design effectively responds and changes to the individual viewer's screen. As a result, your booking engine will look great and keep its functionality no matter the viewer's device. Since pictures are worth a thousand words, engaging images lead to longer time spent on websites and higher conversions. These images should be photos of the rooms and must be designed to increase the chances of conversions. It's imperative the layout makes it easy for visitors to navigate the site easily while keeping the goal of booking rooms obvious. Mobile booking engines should offer a highly visible booking calendar that stands out from the rest of the page to get the attention of the user. The entire preface of mobile technology is people for to do more in less time. According to the People's Web Report conducted by Netbiscuits, 61% of global consumers said faster download of content increases their satisfaction with the mobile web experience. In any case, content is king! Make sure the mobile engine provides the customer with descriptions of the rooms, location, facilities, areas of interest around the property, and anything else that adds value to the user. While managing all of these elements can be a task, it's imperative to know whether your booking engine is optimized for mobile devices. On one hand, a mobile optimized booking engine that is mobile optimized will appeal to the masses. On the other, if your booking engine isn't mobile optimized, it will drive traffic away and possibly suffer a staggering Google penalty. Recently, Google announced websites that are not mobile friendly will have a negative impact on how the search engine giant ranks the sites. If you are unsure whether your booking engine is mobile friendly, test your booking engine today at Google Webmaster Tools. If your booking engine fails to pass the test, it's the prime time to get optimized for mobile devices and more. 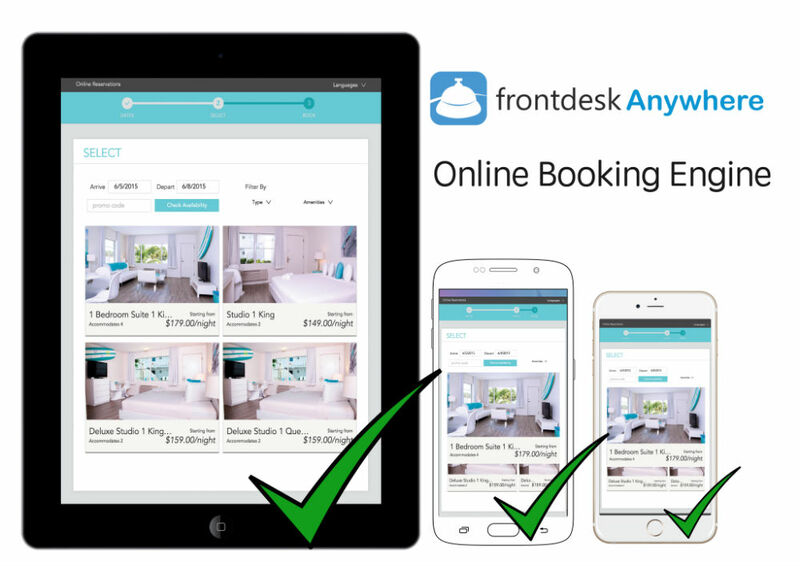 Frontdesk Anywhere's booking engine has passed the mobile test and offers the premier responsive design with boatloads of other mobile-friendly features.